(Newser) – There's a good chance you broke the law on your way to work today—at least in the eyes of Minnesota police. 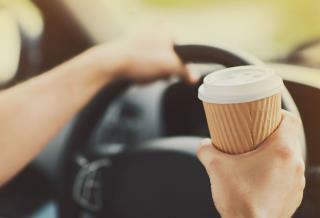 The offense: drinking coffee while driving. Lindsey Krieger tells KMSP she was "dumbfounded" when an officer told her she'd been pulled over for the apparent crime in St. Paul on Wednesday. "It’s against the law to drink coffee while you’re driving,'" she quotes the officer as telling her. As it turns out, the cop let her off with a warning for the coffee but gave her a ticket for not wearing a seatbelt (which Krieger says she unbuckled only after being pulled over). Number one basic rule when a cop pulls you over (besides smiling politely): NEVER take your seat belt off until the officer is with you & sees you have it on....and even then keep it on if possible so you don't get written a ticket for that. She's a damn fool with her attitude. The cop did her a favor. I once dropped a cup a coffee on my lap while driving 70 down the interstate I was able to stay in my lane but the screaming coming out of my car you could probably hear in the next county.